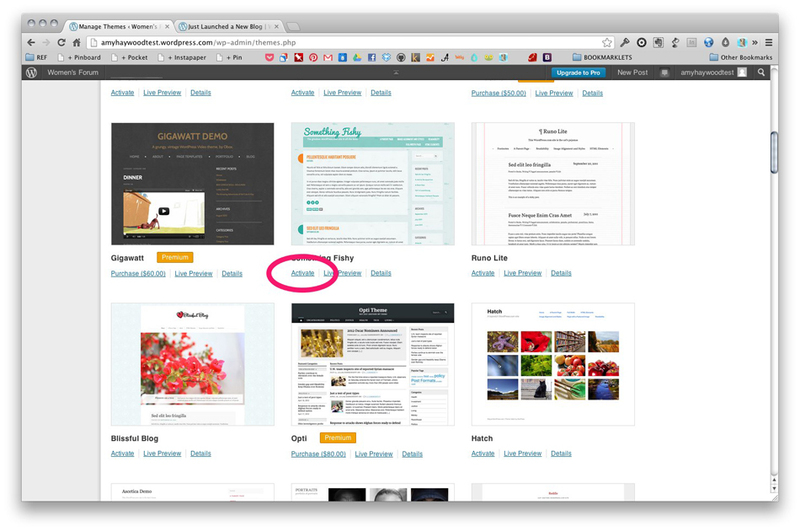 There are several sites that I use consistently in order to stay organized. Some of these sites will seem obvious, but a proper web app has built in flexibility, meaning HOW I use them may be different. Easability – The site has to make it easy for me to use. In some cases, less is more. Syncing – A lot of a site that will sync with my iPhone and iPad. I can no longer be limited to my desktop/laptop. I need to be able to access current information wherever. Getting information in AND out – I have to be able to get information in and out, whenever I want, however I want. I started off using Read it Later (now Pocket and within the past year have switched over to Instapaper. They’re both similar services and so it really comes down to personal preference. 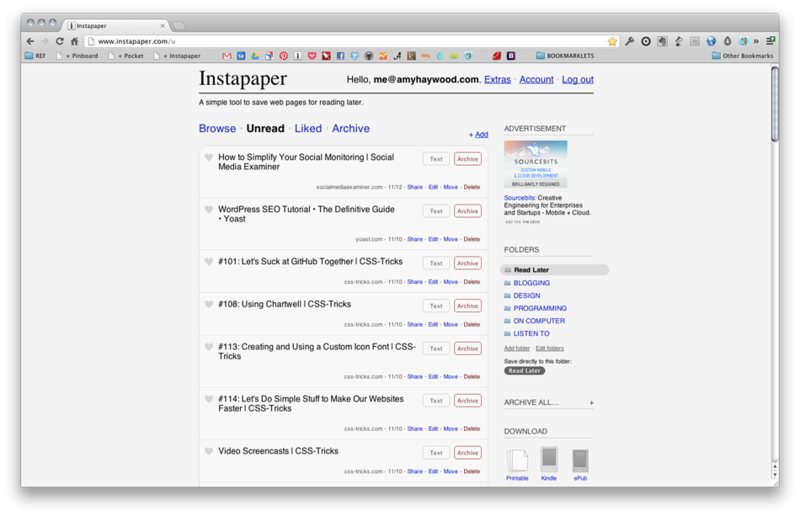 I use Instapaper to flag any longer form article that I run across and don’t have to time to read it in that moment. I have Instapaper on my iPhone and iPad so it makes syncing easy. I can catch up on my reading practically anywhere. All my bookmarks are automatically sent to my Pinboard account. There have been a few times where I’m looking for a post, can’t remember where I’ve sent it, and I know for sure it will show up in Pinboard. Instapaper will compile a document to send to my Kindle each Friday with articles that saved for later. — Again, any format, any way I want it. I’m all about some Google Services and it really does go back to the 3 items I mentioned above. Google is easy to use. I can get it to sync easily with all my devices and even access the information on someone else’s computer. I can share, import, and export easily. All of my calendaring is managed through Google Calendars. I can access it online at work and then have my iPhone and iPad automatically sync so that any updates are automatically pushed to the other devices. I have a calendar set up for each area of my life, which doesn’t necessarily make sharing calendars easy, but it does mean that everything is color coordinated! I try and put everything date related on my calendar, including due dates and tasks. Some days, I’ll even schedule everything out for the day, so that every minute is accounted for, just to make sure everything gets done. Ease of use. 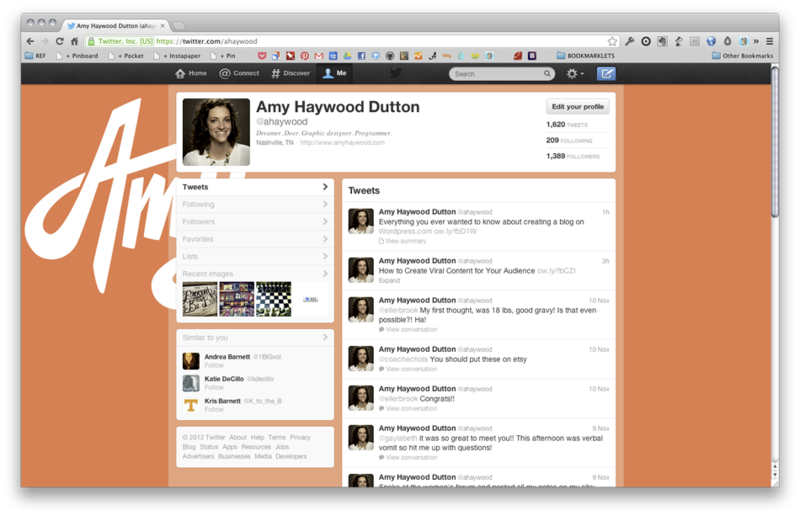 It’s easier for me to open a new tab in my web browser than it is for me to launch Numbers. Sharing. I can share any document. For example, my husband and I share a document with our monthly budget. Or, I’ve shared business ideas with potential partners. Or, site documentation with freelance clients. It’s so much better than emailing an Excel document back and forth and trying to keep up with which version is the most recent. Syncing. I can easily pull up any document on my iPhone or iPad when I’m on the go. I even write all my blog posts in Google Docs. I have a “Drafts” folder and a “Published” folder. Each week, I’ll plan out what I want to blog about. I’ll put the post title on my Google Calendar. 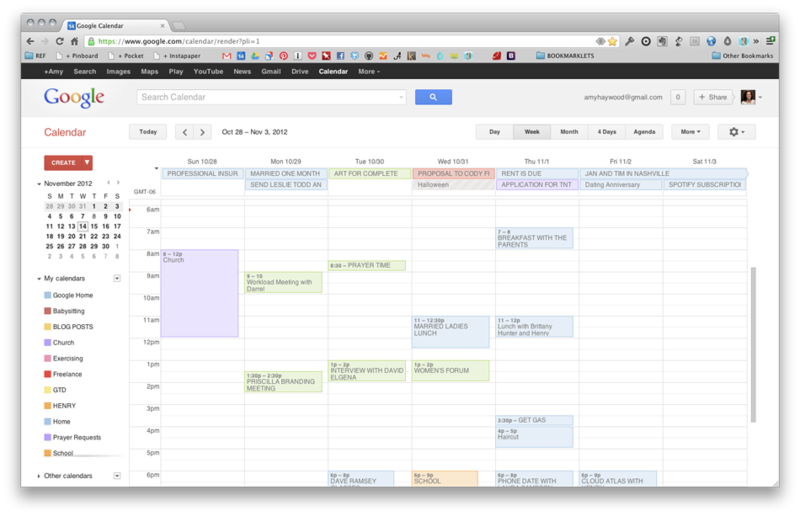 Then, I can actually, attach the Google Doc to that particular event in my calendar! Jenny Blank actually got me thinking in this direction. She’s a former Google employee and now manages the blog Life After College. She has her whole in Google and does a great job of sharing some of her Google Doc templates and methods for staying organized. I have several different email addresses, but they all forward to one Gmail account. 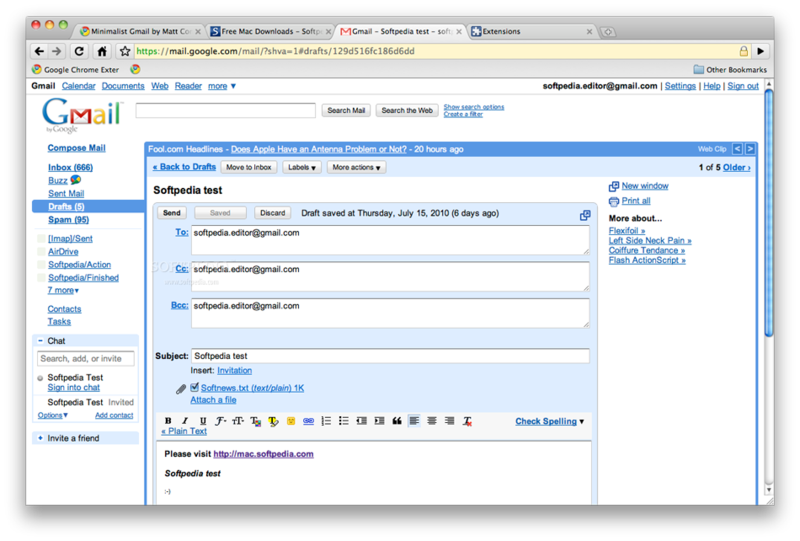 I try and tag everything and aim for Inbox Zero. The three most important tags I have are @Action, @FollowUp, @NonImmediate, and @Read. I’m a fan of GTD and so (on a good week), when I’m doing my weekly review, I got through those boxes to make sure I didn’t miss anything. A huge help, though, has been Boomerang. My favorite feature is Send Later, but it will also remind me if I need to follow up with someone or if I want to get it out of my Inbox, but come back and remind me later. 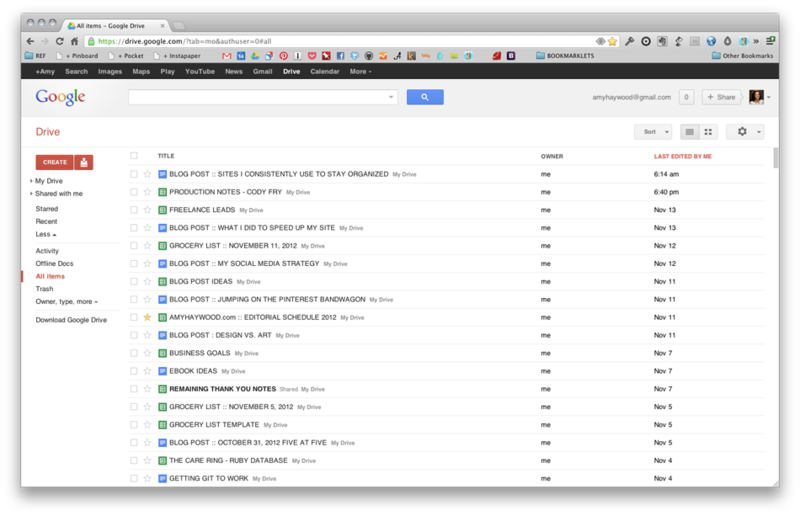 I keep track of all my blog feeds through Google Reader. That doesn’t mean I necessarily always use Google Reader for reading, there are other applications, like Reeder (for Mac, iPad, and iPhone), that I use. 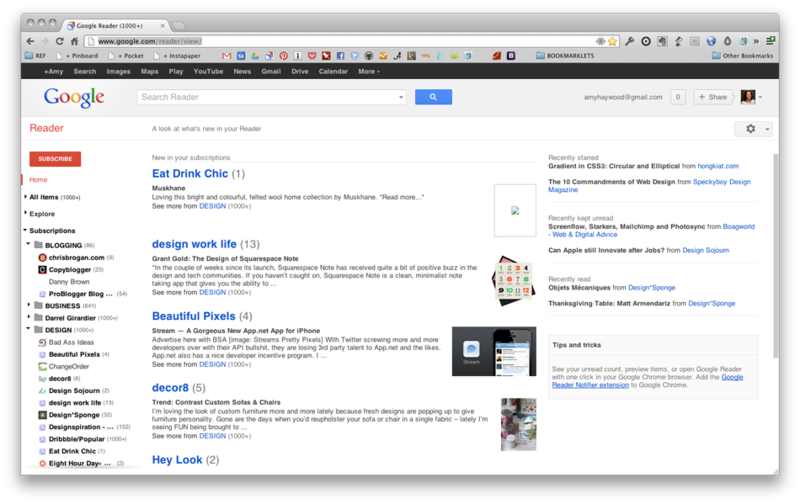 But, everything is at least synced through Google Reader. I use Evernote to store all images of things I like. It’s basically my personal Pinterest. 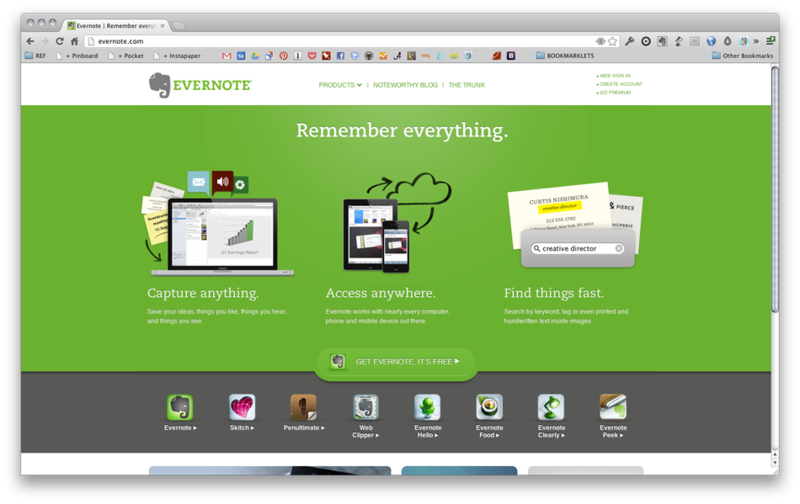 I double up, saving things in Evernote and Pinterest because Evernote saves my information locally. I feel like it’s “mine” versus sending it to a 3rd party online. Also, Evernote has image text recognition. Meaning, I don’t necessarily have to tag an image as “gorilla.” But, if it has the word “gorilla” on there, Evernote will read that text and still return that image as a result. = Much more versatile. Again, it’s all about being able to save data and get it back out whenever and wherever I need it. I’ll also save snippets of code in Evernote or ways I troubleshot a programming issue I was having. This makes it easy when I encounter the issue again and can’t remember how I solved it. It takes Evernote a while to load up, particularly on my iPhone and iPad, but then again, I have almost 15,000 notes (not exaggerating). This is one of my favorites. Dropbox has a folder that sits on my computer. Anything I place inside, automatically syncs with my iPhone and iPad. I love it, not only for getting files on the go, but it makes it easy to share files and collaborate with others. Additionally, I have several services that backup and sync via Dropbox. 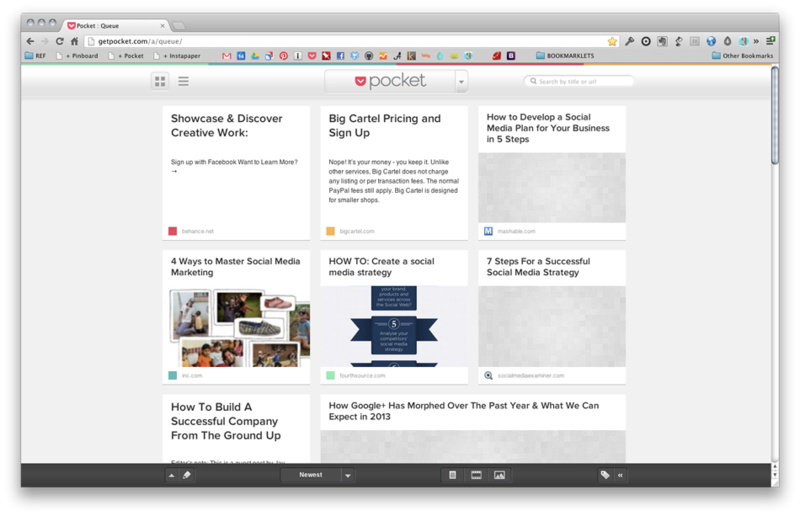 I use Pinboard for all my bookmarks. I used Delicious back in the day (and in a lot of ways liked it better), but when it got bought out by Yahoo, I switched to Pinboard and haven’t looked back. I save everything…well…almost everything. I’ll save links to Photoshop brushes and Mac Applications and things I find online that I eventually want to share on my blog. I use Hootsuite to manage my Twitter account. I schedule most of my Tweets, that way I can set them up once to send throughout the day. 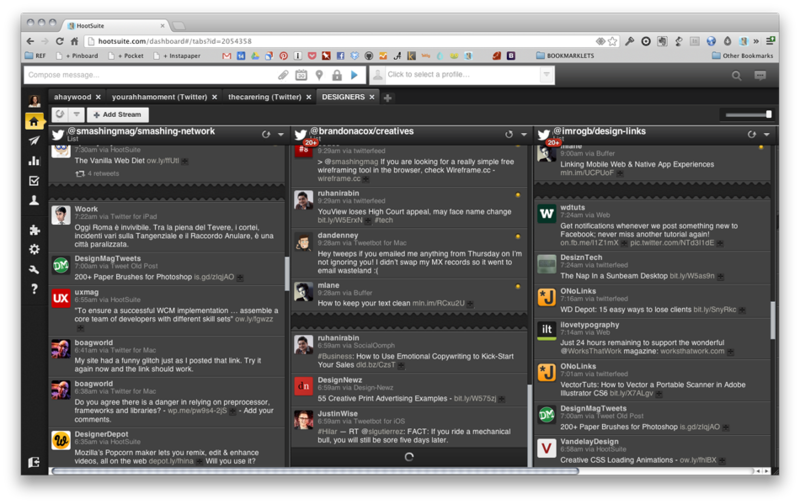 I also like Hootsuite’s layout, where I have several different columns of information. — my feed, direct messages, @replies, favorite tweets, pending tweets, designers I follow, you get the idea. Actually, almost all the links and design resources I find come from my Twitter list of designers. This site is easy to forget about, simply because I set it up once and it runs magic in the background. But, the beauty of this site is that it has most of these sites I’ve listed, working together. IFTTT stands for If This, Then This. Basically, it sets up conditionals, or recipes, for various sites and will automatically run a set of actions, if triggered. For example, every time I take a picture on Instagram, that picture is automatically downloaded and backed up to my Dropbox folder. Cool, right?! 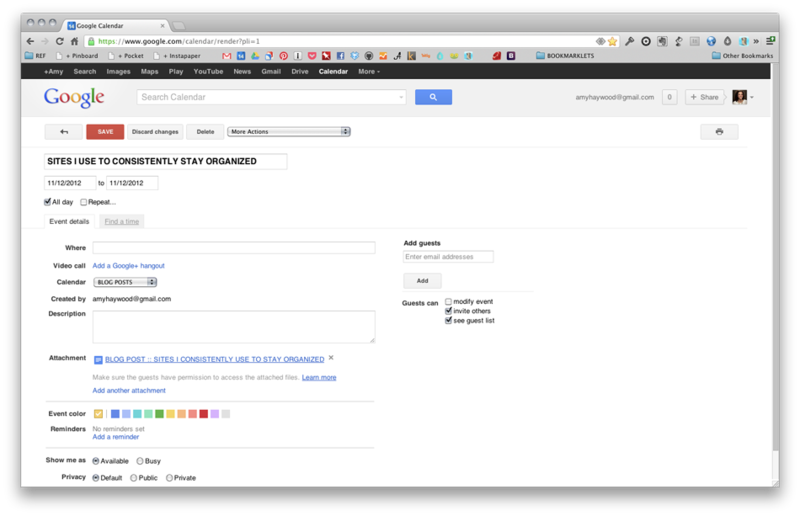 Or here’s another: if I star something in my Google Reader, then, it will automatically create a bookmark in Pinboard/. 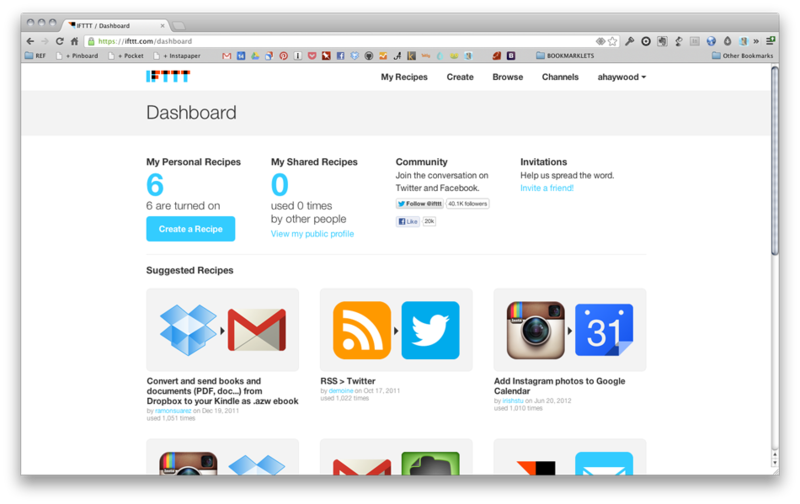 Plus, the site has plenty of predefined recipes that you can use, if you’re having trouble coming up with ideas. It seems like everyone knows what to do, but how do you actually implement it?! It’s all really good in theory, but what does it really look like put into action? I’ve decided to share my own strategy. I used to have my Twitter and Facebook account connected. Any tweets would automatically go to Facebook. But, I had several people tell me, “I look at the things you post and it’s over my head. I don’t get it.” As a result, people stopped paying attention to my Facebook account and my own sister unfollowed me on Twitter. I decided to use my Twitter account as a way of interacting with other designers and programmers. So, I’ll tweet things about design and programming. (You are what you attract.) Occasionally, a personal tweet will work it’s way in. But, for the most part, design and programming. On a good day, I try and tweet at least 3 different links. For me, Facebook is personal. The people I’m friends with on Facebook, I know personally. So, I’ll post updates that are just that: personal. Since I’ve disconnected my Twitter account and been intentional about what I post on Facebook, I’ve had far more comments and likes than I’ve had in a long time. I’m (honestly) still trying to figure this one out. 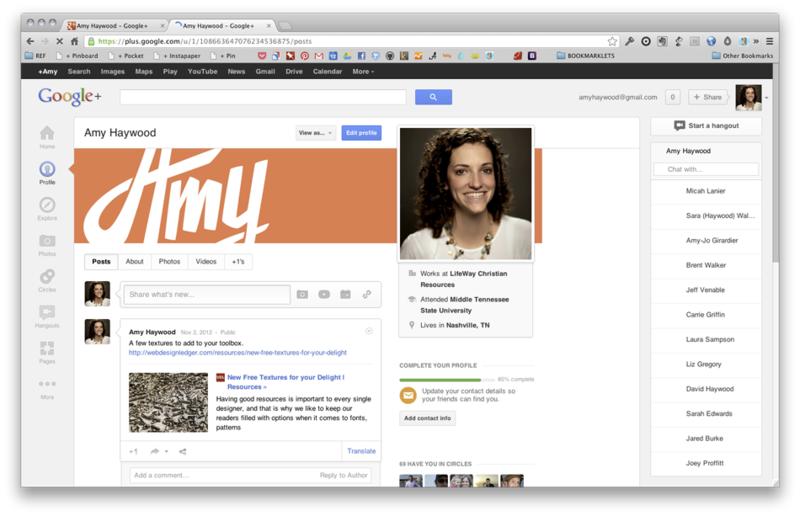 I started reading Guy Kawasaki’s book on Google+ and I was amazed at the potential that Google+ has. I remember conversations when Google+ first started, “It’s going to be better than Facebook and Twitter.” But months later, I’m not sure that’s the case (DISCLAIMER: I’m not sure what the numbers are, I’m just speaking from my own personal experience.) I’m still trying to decide if this one is worth the effort. I finally jumped on the Pinterest bandwagon. I was an early adopter and had an account before anyone else knew it existed (September 3, 2010, to be exact), but never posted anything. It has always bothered me that they own the content that I post. If I post all my inspiration there and something happens and their service has to be shut down, then I’ve lost all my inspiration…well, you know what I mean. I’ve lost all the images I’ve used for visual research. Originally, that’s what I envisioned the Things I Like section of my site to be, a personal pinboard of sorts. But, I can’t argue with the fact that companies are getting more referral traffic from Pinterest than Google (myself included). So, I still grab images and stick them in my Evernote account, but I also pin them. It’s been fun to watch which pins get repinned and the things my friends find interesting. I pin everything from illustration to posters to interior design to recipes to my own work. 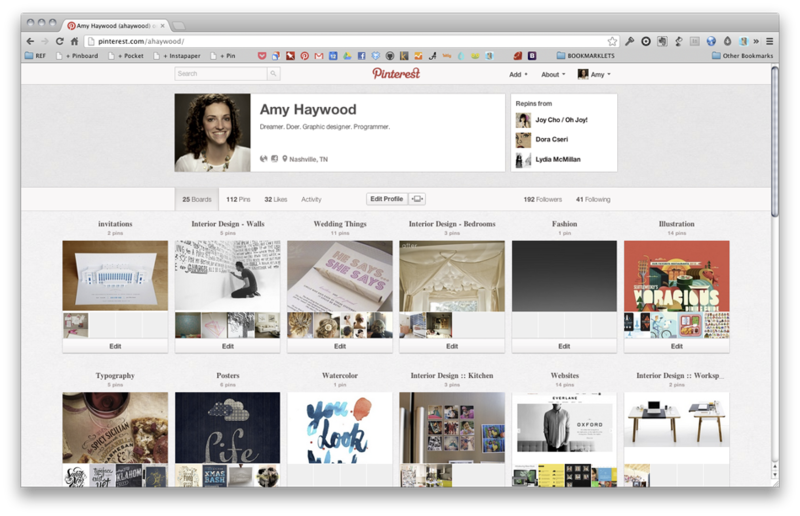 I’m in the process of rebuilding the Things I Like section of my blog to pull from my Pinterest boards. 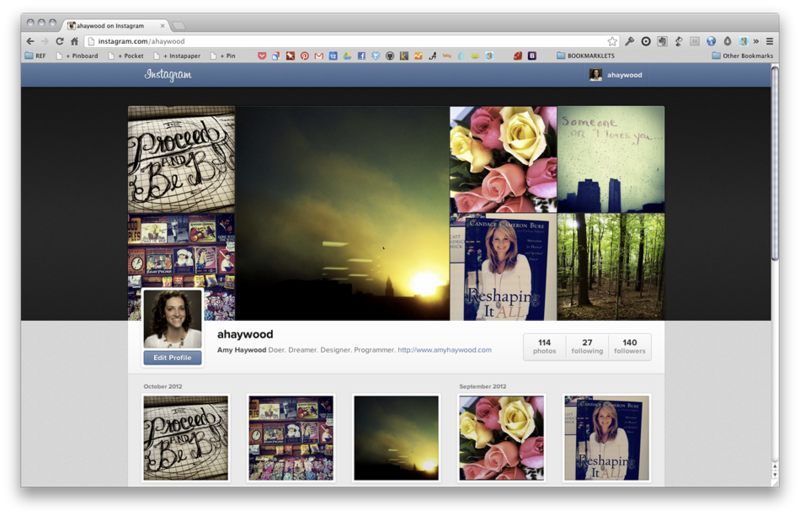 I use Instagram about the same way that everyone else does. I take pictures and post them to Instagram. The pictures I take are probably more personal than not. Even other iPhone Photography services that I’ve used for the filters (tada, Snapseed, and Camera+), I’ll still export to send to Instagram. One day, I still want to participate in fat mum slim’s photo a day. I want my blog to be my primary online presence. I want it to be a representation of who I am. — So, I post general things about social media and technology to help educate my clients, photography, design, personal things about my life, things I find on the internet, and programming snippets I’ve found. Honestly, I still struggle with finding a niche, but at least for right now, this is better for me than trying to manage 6 different blogs, each one dedicated to one of these topics. My posts are more long form in nature. The goal is to write at least one post a day, during the week. In the comments: What has been your strategy? What works for you? What doesn’t? 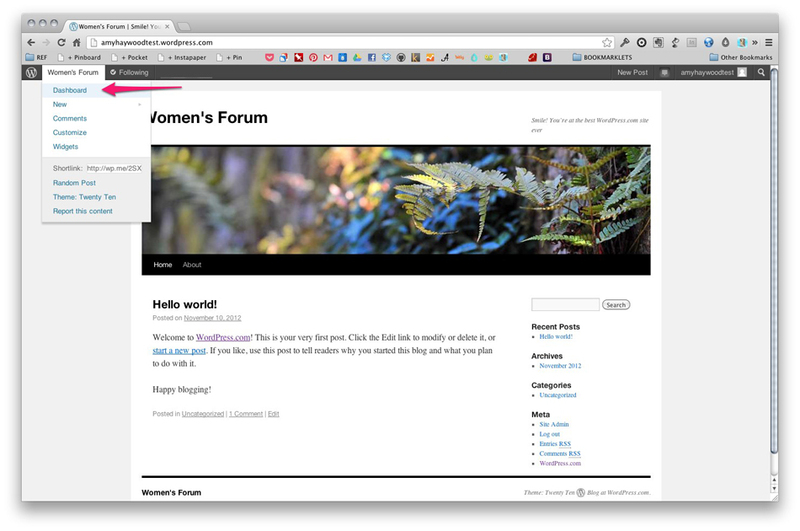 Darrel and I gave a talk at the Women’s Forum on WordPress and how to set up your own site. 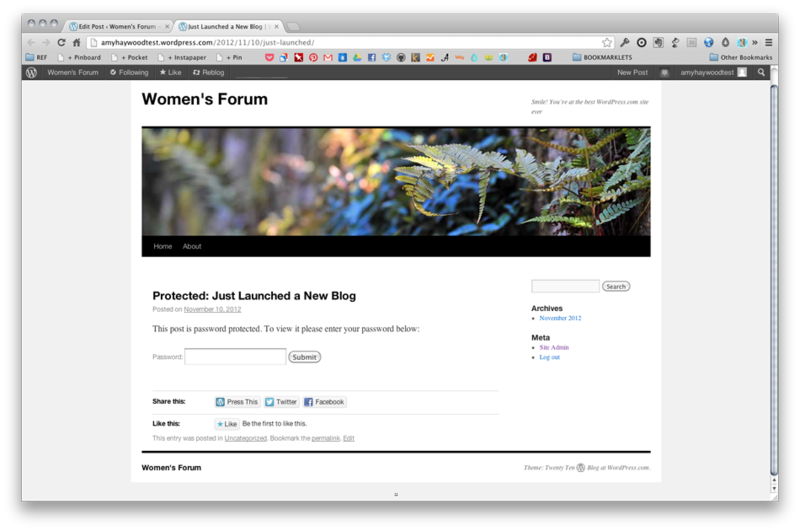 I’m sure there are a lot of women’s ministries out there that want need a web presence, but don’t know where to start. We wanted to show you step by step how that’s done. So, whether you sat in our group in Nashville and need a refresher, or missed our talk and want to know what it was all about, or stumbled upon this post, welcome! If at any point, you run into issues or have a question, please feel free to jump down to the comments at the bottom. I’ll do my best to respond as quickly as possible. 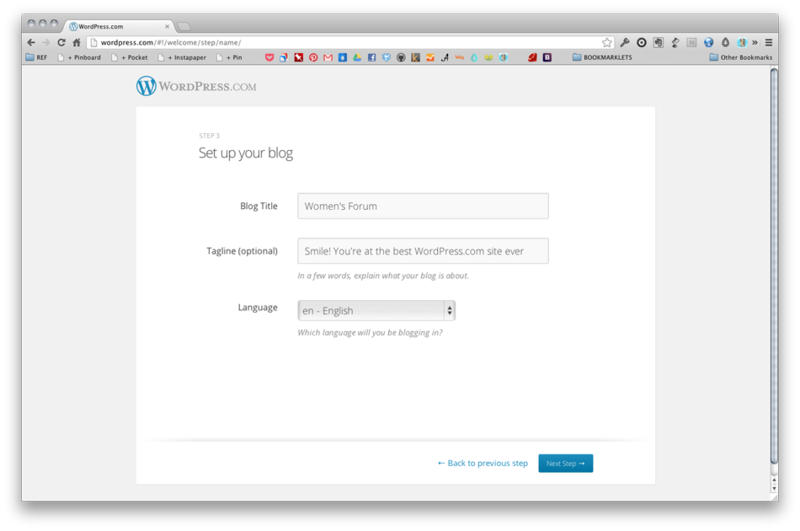 First things first, why WordPress? Did you know, there are currently more than 57 million WordPress sites?! WordPress is one of the most popular platforms. With everything they offer, the possibilities for your website are limited. 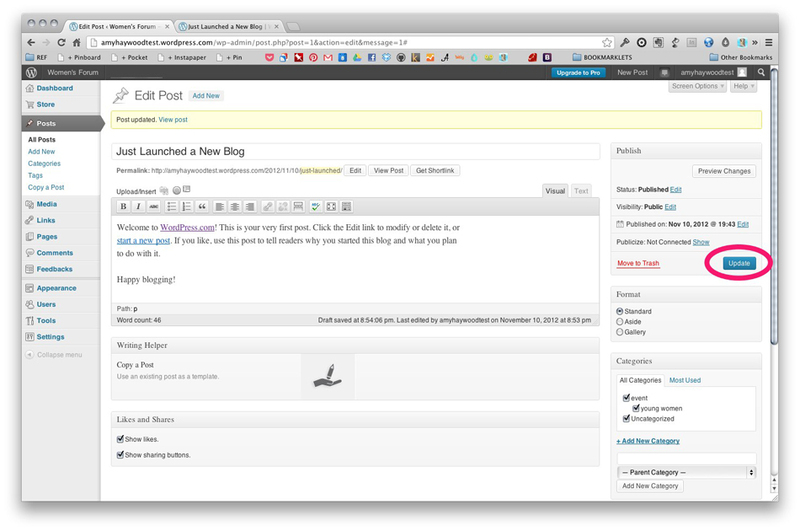 It’s no longer just a blogging platform, but is perfect for managing full blown out websites. It’s so easy to customize your site’s look and make it uniquely your own. NOTE: However, if you want to look at a few other options, check out Tumblr, SquareSpace, and/or Blogger — all great alternatives. Believe it or not, there’s a difference, and it’s not just the URL. WordPress.com is a hosted solution and WordPress.org is open source. What does that even mean? Well, if you go to WordPress.org, you can download all the code yourself. 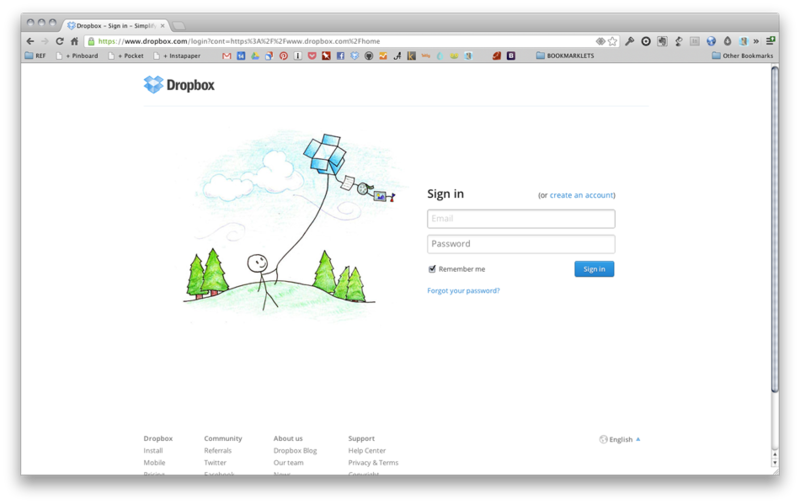 Then, you can put it on your own server, set up your own database, and your own domain name (URL). Pretty cool! The problem, is that puts a lot of the tech responsibility on you. It’s not hard, but I’ve also done it a thousand times. If you don’t know what you’re doing, it can pretty intimidating. The other advantage to a WordPress.com and WordPress.org is security. WordPress.com takes care of all of it. Otherwise, you’re responsible for upgrading WordPress’s code when revisions and patches roll out. Darrel can speak from personal experience in all that. His wife’s blog was running on a .org account. She got hacked a few years ago. 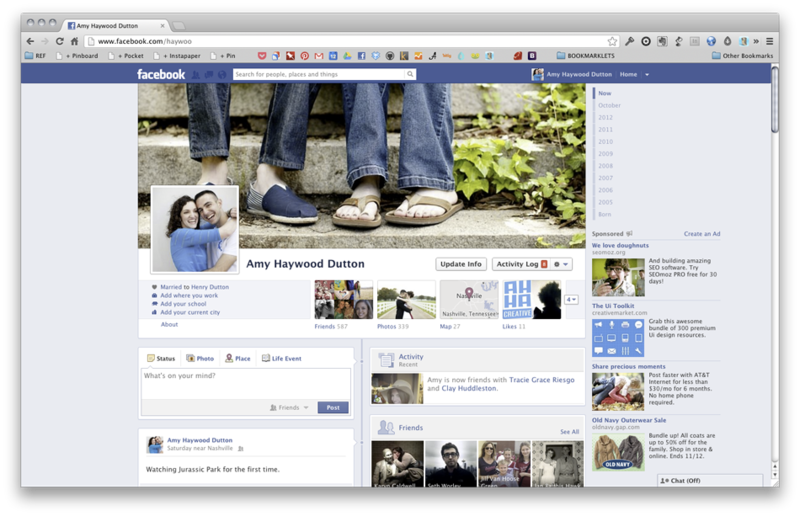 Fortunately, Amy-Jo logged in the same time the hacker was in the process of deleting everything. They were able to restore her blog, but again, it could have been prevented if she was on a .com account. — Hear me say this, though, a .org account is not evil! 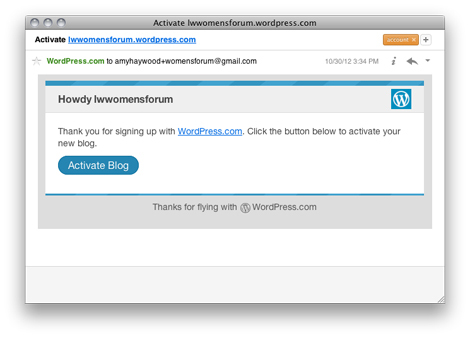 In fact, this blog is running off a .org WordPress install. It just requires a little more attention. You can quickly (and easily) fill out the form provided. At the bottom of the form are two different options. You can either pay $99 for a premium account or for a few less options, have a free account. 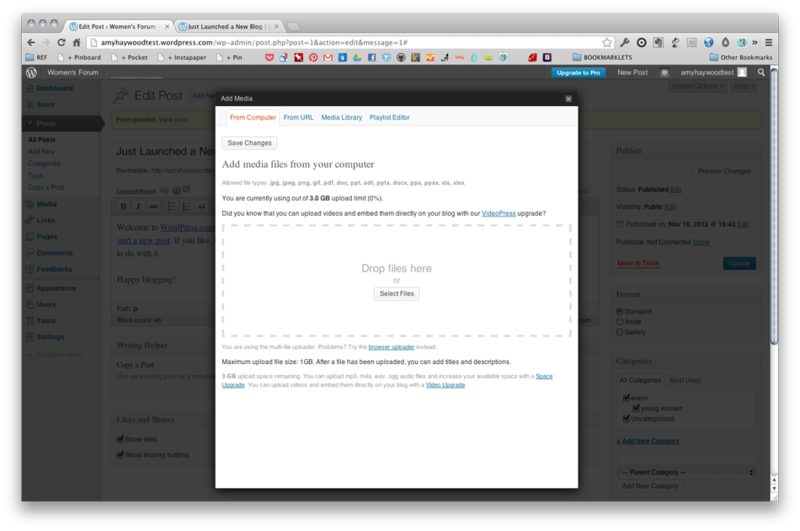 WordPress is always willing to take your money. So, feel free to sign up for a free account and upgrade later. You’ll get an email confirming your address. Simply follow the activation link. 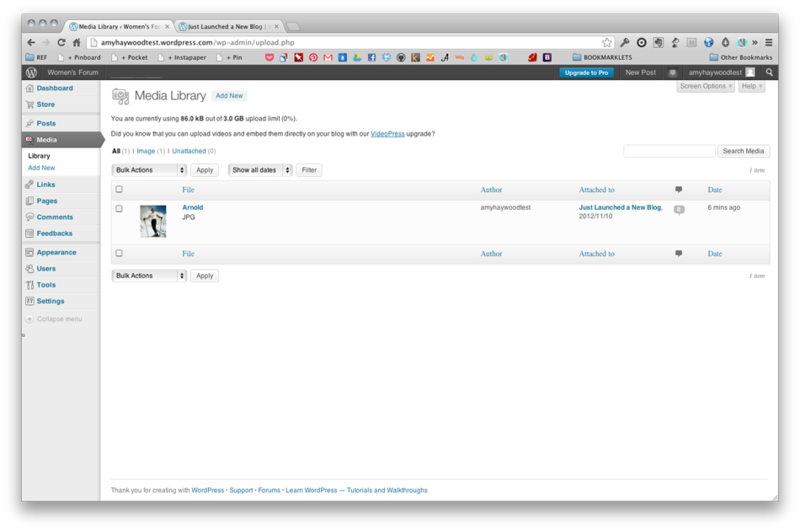 WordPress will walk you through a few screens to get everything set up. I skipped through the first couple screens because they’re related to content you’re interested in and connecting your other accounts (like Facebook and Twitter). You can always come back to these later. 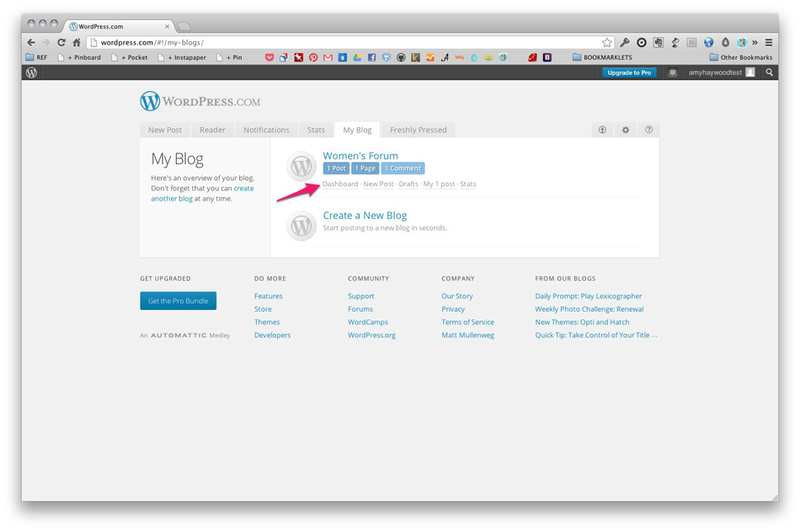 Then, WordPress will ask you about your blog. What’s the name of your blog? Tagline? Again, you can always change these after the fact. 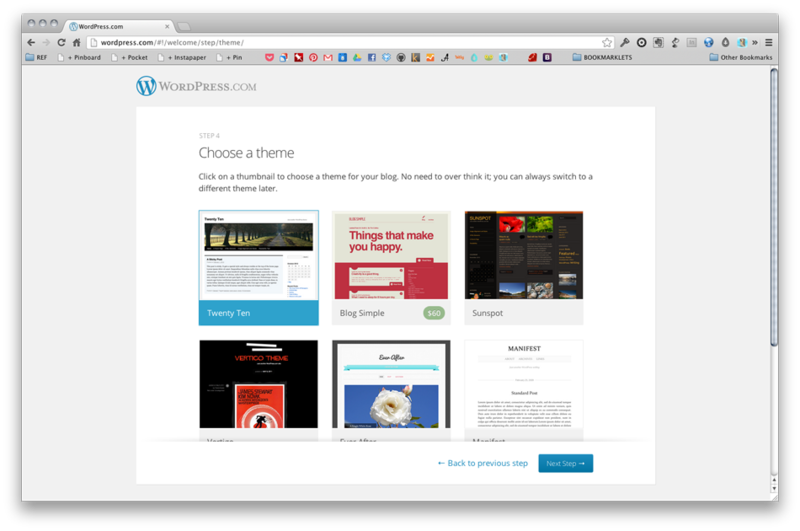 You’ll need to choose a WordPress theme. The options here are literally endless. There are plenty of free and paid options. –Don’t worry, as I said before, you can always change this later. Last step. 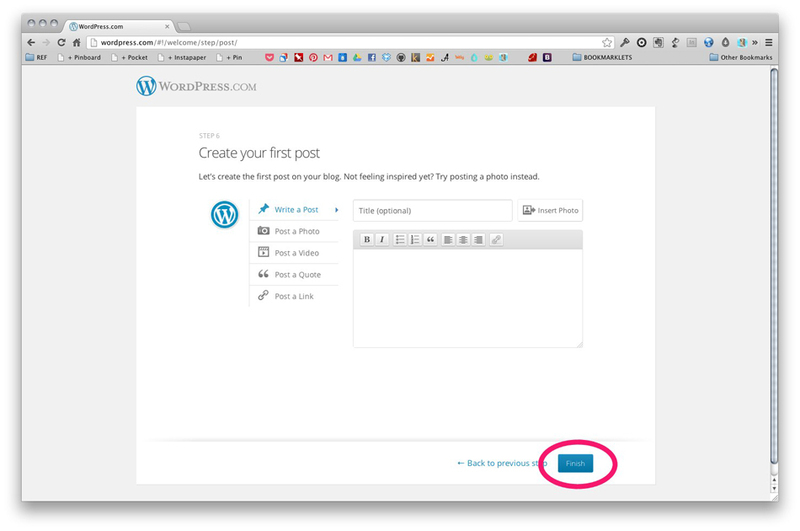 WordPress lets you post your first blog post. You can either take the time to write your post here, but personally, I prefer to do this later, once I’m actually in the admin panel for my blog. Done! 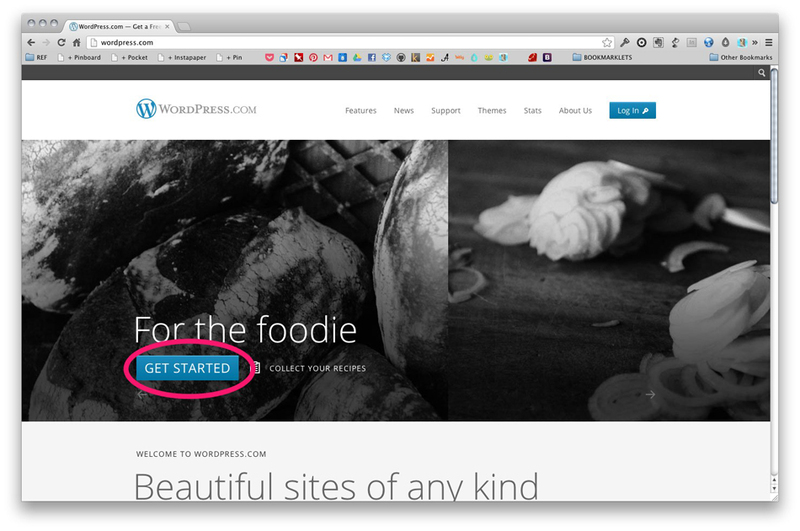 You now have a WordPress site! Congratulations! It was that easy! Now, let’s talk a little about customizing. These next screens are designed to make it easy to find content and post it. To me, this is the only confusing part about WordPress.com. You essentially have 2 dashboards. 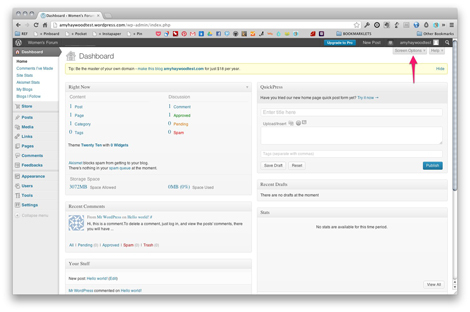 A dashboard for your WordPress account and a dashboard for your actual blog. They look completely different, so that helps a little bit. 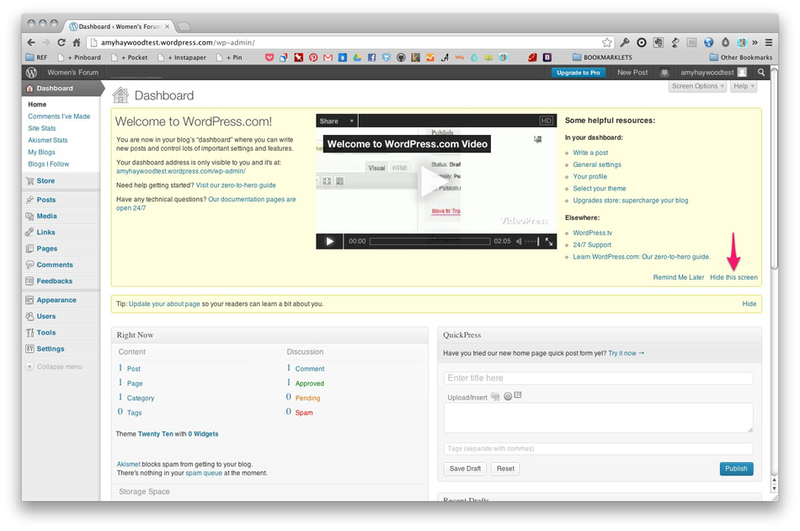 Your WordPress dashboard manages your WordPress account. 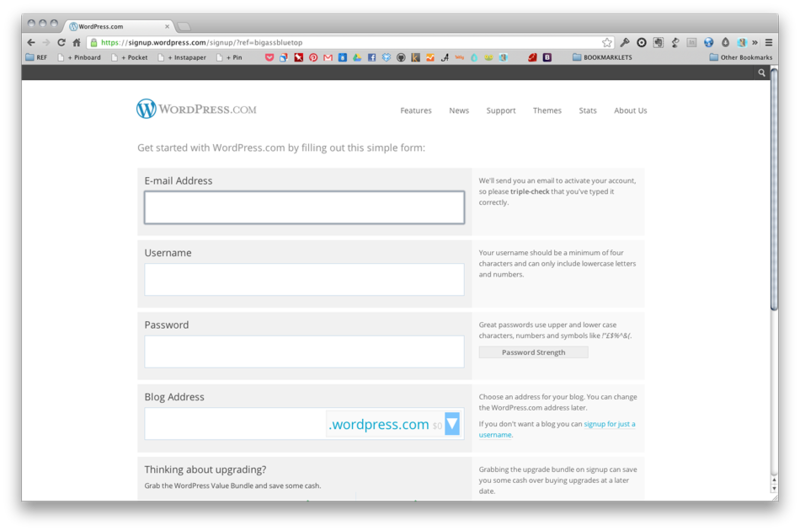 This is useful if you have multiple WordPress.com sites, this makes it really easy to access all of them. 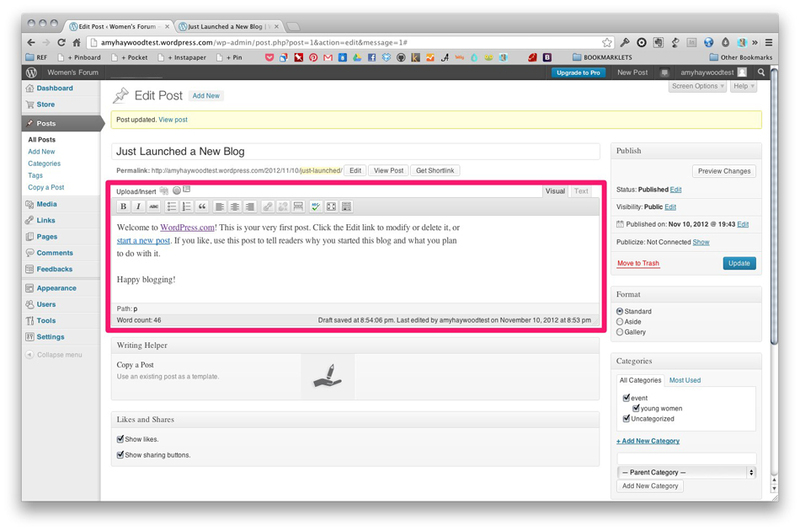 Your blog dashboard manages just that one blog. We’ll go there now. 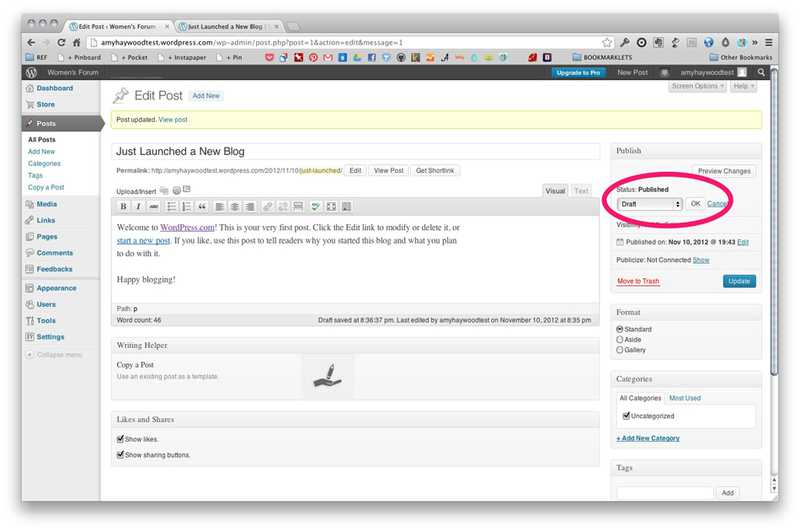 If you click on the “My Blog” tab, then, you’ll see the name of the blog you just created. If I click on the name of the blog, it will take me my actual blog. This is what everyone sees. Congratulations you have a site! Since we’re logged in, there’s a bar at the top of the page. 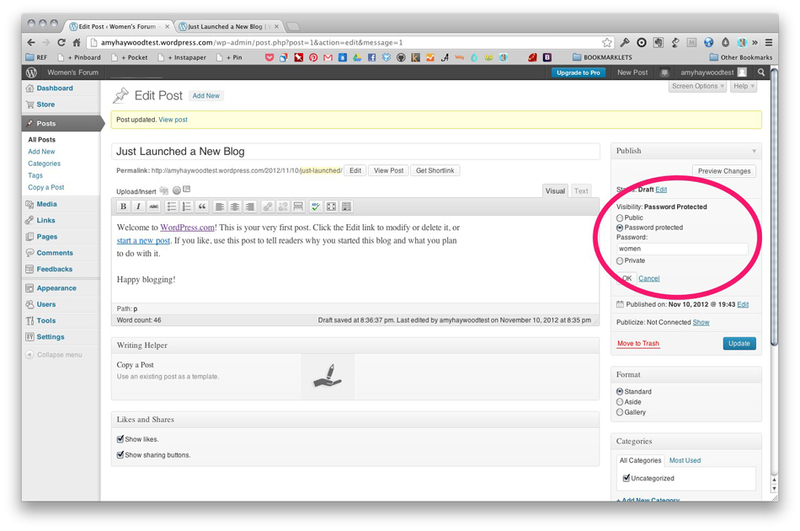 If you hover over your blog name, a dropdown menu will appear, click on Dashboard. You can also get here by clicking on the Dashboard link listed under your blog. Now, we’re in your site’s backend. So, we’re just going to walk through the left sidebar. I’m only going to cover the most important pieces. But, if you run into an issue that I didn’t address, don’t hesitate to hit me up in the comments. 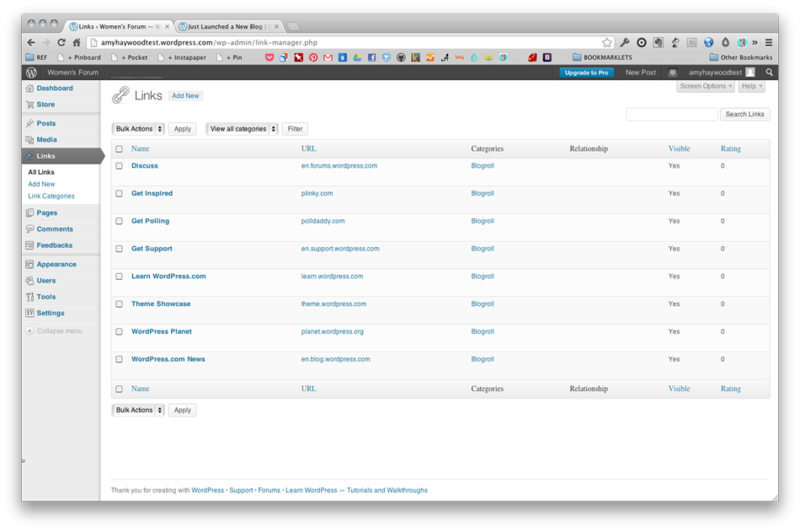 NOTE: Every WordPress theme is different. Certain features are enabled in some themes and not in others. Mainly, this relates to featured images, menus, and widgets. For the purposes of this post, I’m working with the theme Twenty Ten. 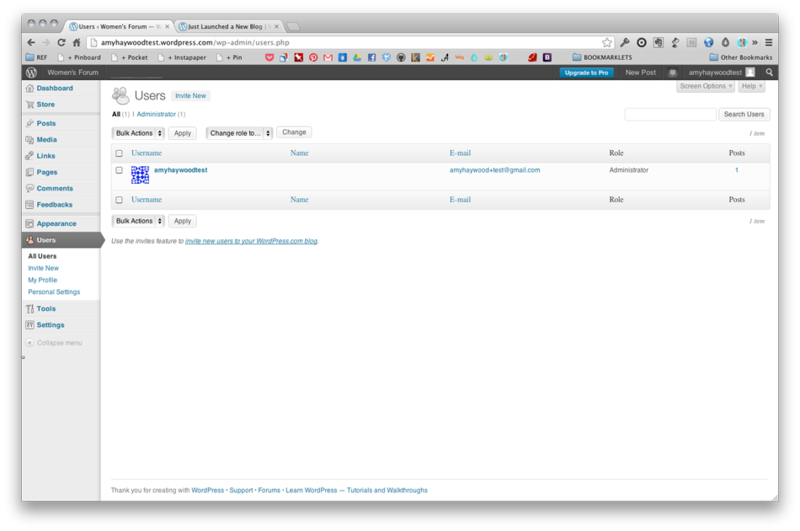 It’s actually the default theme that rolls out with WordPress. 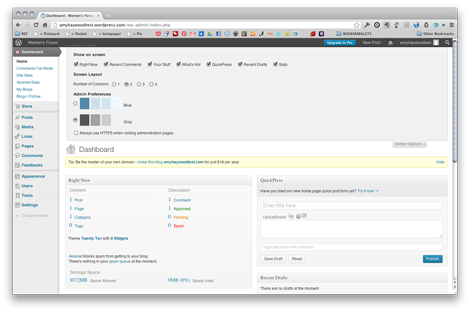 But, if you get in there and find you need functionality that your theme doesn’t offer, feel free to mix it. 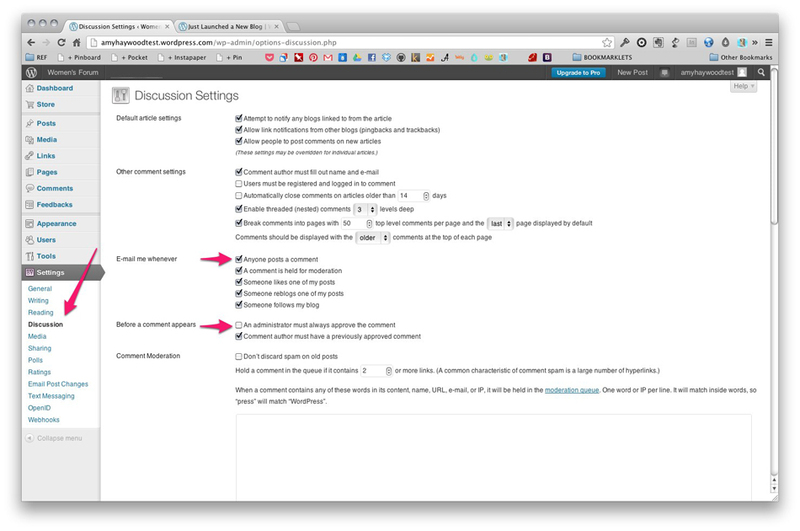 Jump down to the section where I talk about changing your site’s theme. This is your site’s backend. Everything that happens on your site is controlled here. Pretty cool. The first thing and maybe the most important thing to keep in mind is that YOU WON’T BREAK IT. Don’t be afraid to click around. If something messes up, you can ALWAYS change it back. 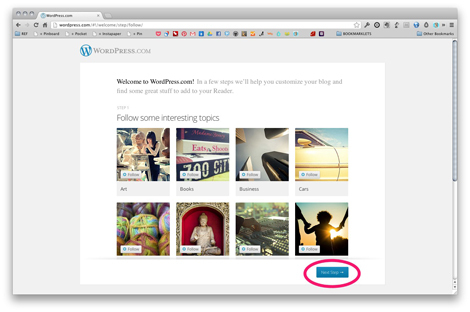 WordPress has a few help links to get you started, if you’re still a little gun shy. I’m going to go ahead and close this message, though, and start cleaning up my Dashboard to get it to look the way I want it to. In the top, right corner, you’ll see a tab that says Screen Options. If you click on that you can change which boxes appear on your screen. Personally, I like to turn almost everything off. But, the keyword there is personally. I’m the only one that sees this Dashboard. Any customizations I do are there to help me. You can also drag the headings on the boxes around to change the order items are displayed. Each box is pretty self explanatory. 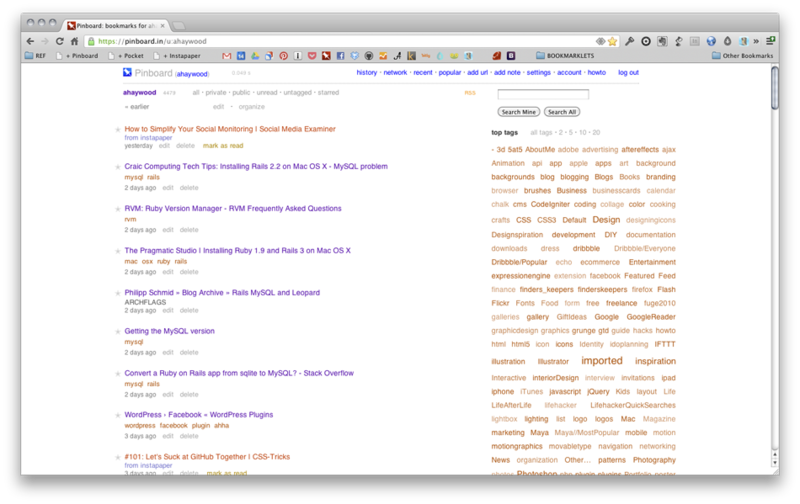 They give me a glimpse of what my site looks like overall: how many posts, pages, categories, and comments I have. I can post quick posts in the QuickPress section. I see my stats in the Stats box… you get the idea. Posts are for a blog. There are a bunch of those. This is the section of your site that you’ll constantly update. Pages are used for static content on your site. There’s only one of those. For example, you might have an about page or a contact page. Chances are, you’ll set those up once, maybe update once a year, but that’s it. Let’s click on the Posts link in the left sidebar. This page will list out all the posts you’ve written. 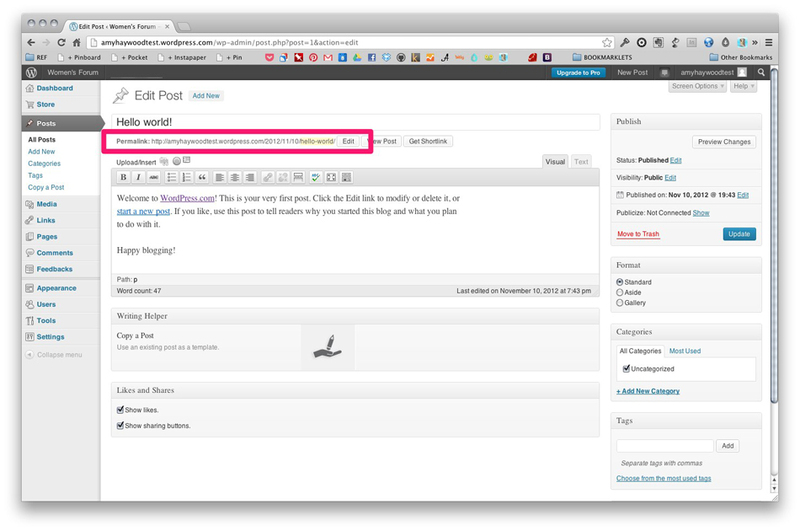 By default, WordPress starts with 1 post, called “Hello World.” You can click on the post title to edit it or you can click on the Add New link at the top or left sidebar to create a new post. 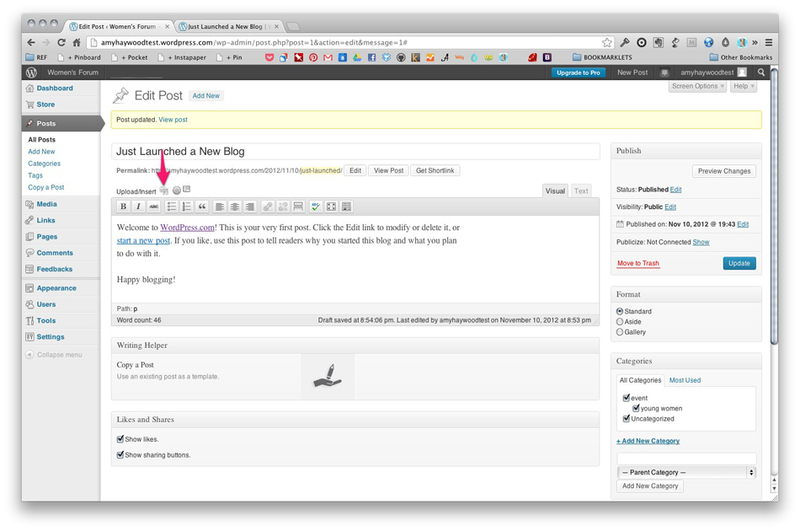 I’m going to modify the post WordPress started with because I want to change that post anyway. Then, you’ll see a line right under the title that says Permalink. What’s that?! Well, it has nothing to do with going to the hair salon. (Cheesy joke, I know. This can be dry, so I at least needed to add in some humor.) A permalink is the permanent link to that page. I usually go with the default, but in this case, it still says “hello-world” at the end because that was the title of my old post. I’m going to change it to just-launched. As you can tell, any spaces you entered are automatically converted to dashes (-). That’s a good thing! You NEVER want spaces in your URLs. Usually I’ll leave my permalinks set to the default. Part of the reason they exist is to help your reader (and Google) know what the post is about. Think about it. If I send you http://wp.me/p2SX53-1 (the short link) you don’t know what this post is about. But, if I send you http://amyhaywoodtest.wordpress.com/2012/11/10/just-launched/, you can kind of tell by reading the URL, what type of link I’m sending you. Once a permalink is set, DON’T CHANGE IT. If someone links to your site, but you’ve changed your permalink, the link is going to be broken. It will come back as a missing page. Set it once and leave it. The main text area is where you’ll spend a bulk of your time, writing. There are buttons there where you can easily format your text, bold, italics, bullets, numbered list, etc. If you want to add an image, click on the camera / musical note icon and it will launch a window for you to add an image from your computer. Once the file is uploaded, you can add some additional information. When you’re done, simply click the Insert into Post button at the bottom. Scroll down, you’ll see a box called Likes and Shares. By leaving those boxes checked, it automatically adds share links to the bottom of my post! On the right sidebar, there’s a box called Publish. It contains information about your post’s publish status. If you wanted to leave the post as a draft and come back to it later. Simply, click on the Edit link next to Published. A drop down will appear and you can select Draft and click the OK button. Now, when you save your post, it won’t appear on the site! The Visibility line determines whether your post is visible to the public. If I click on the edit link, you’ll see several options appear. I can leave it Public where everyone can see it or I can make it Password Protected or Private. If I choose password protected, it will let me set the password on a per post basis. In the context of women’s ministry… if people share their prayer requests and I want to post them on the blog, but I don’t want them to be available to the public, I can simply make that post as password protected and give my group the password they need. A Private post simply means only I can see it. The categories box let’s use choose which categories this post is assigned to. You can add a category by clicking on the Add New Category link. Type in the category you want and click Add New Category. Done! You can nest categories by selecting the Parent Category from the dropdown box. So, now that I’ve created an event category, I may want to add a subcategory called young women. 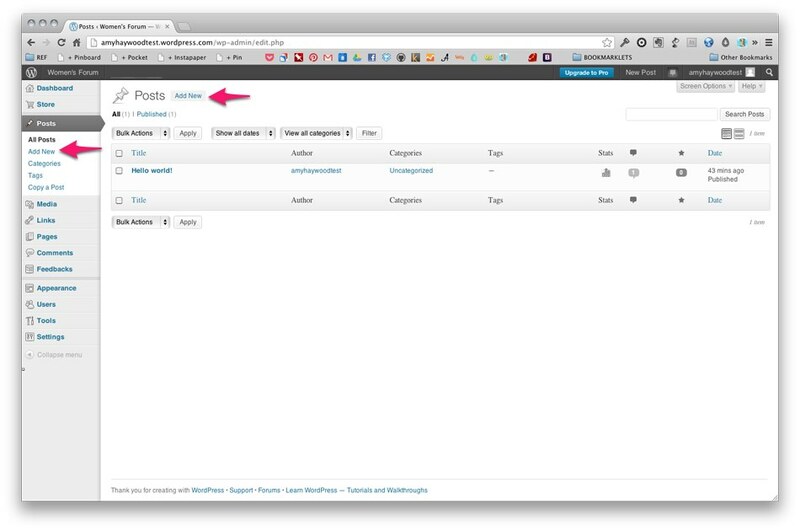 The tags box allows you to tag a post. 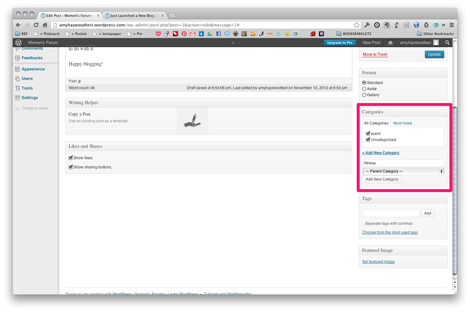 You can simply add tags by typing in the text box field and clicking add. If you want to delete a tag you added, just click on the little x that appears next to the tag’s name. If you want to look at your most used tags for a little bit of help, click on the “Choose from the most used tags” link. So, what’s the difference between tags and categories? Great question! First of all, the whole point of tags and categories is to make it easy for your reader to find the content they want. So, when you’re thinking about how to tag or categorize something, put your “I’m a reader” hat on. How would you want to find your content? What’s the most intuitive way you could label something? 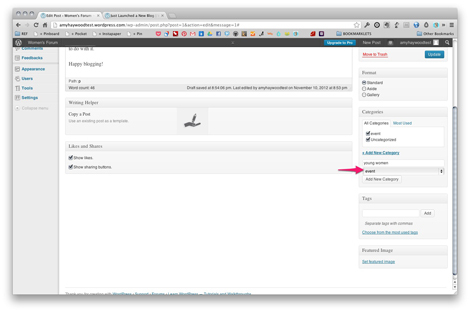 Then, think of categories as large buckets, tags are more granular. So, if I’m running a recipe site, my category might be soup. But, my tags might be chicken or tomato. In general, you want your post to fall into ONE category, but multiple tags. My recommendation is to think of all the categories you want to use, up front. This kind of helps you when you’re writing anyway, that way you stay on topic. There’s no reason to blog about the Titan’s football game if you’re a recipe blog! If you want to do a little extra reading on the subject, here’s a great blog post that goes into a little more depth. OK, so when we’re done. 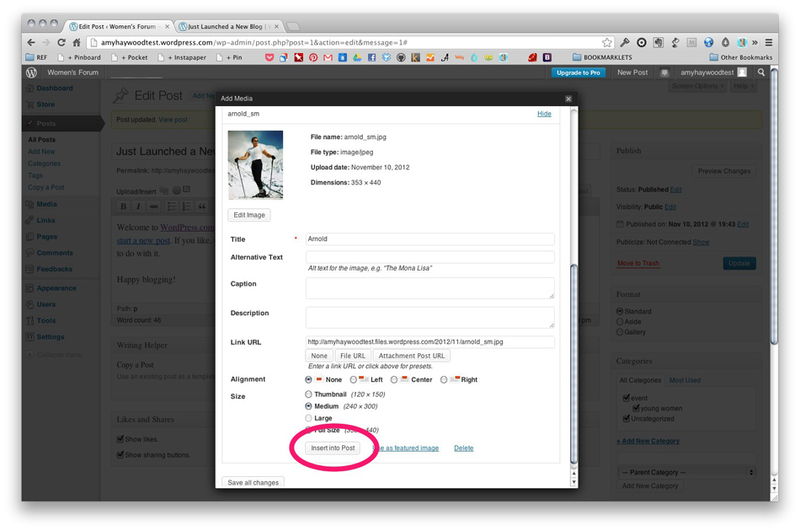 When we’re ready to publish, just click the button in the Publish box. In this case, we’re updating an existing post, so it says Update instead. The media section includes all the images that we’ve uploaded to our blog. I rarely come here, but it’s a great media library, though, because you see the item, which post it’s attached to, and what date it was uploaded. The links section is only useful if you have the links widget installed somewhere on your site. 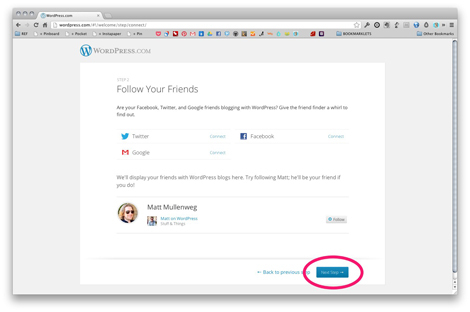 If you do, you could add links for resources or links to a friend’s site. Just like the posts section, you can edit a post by clicking on it. 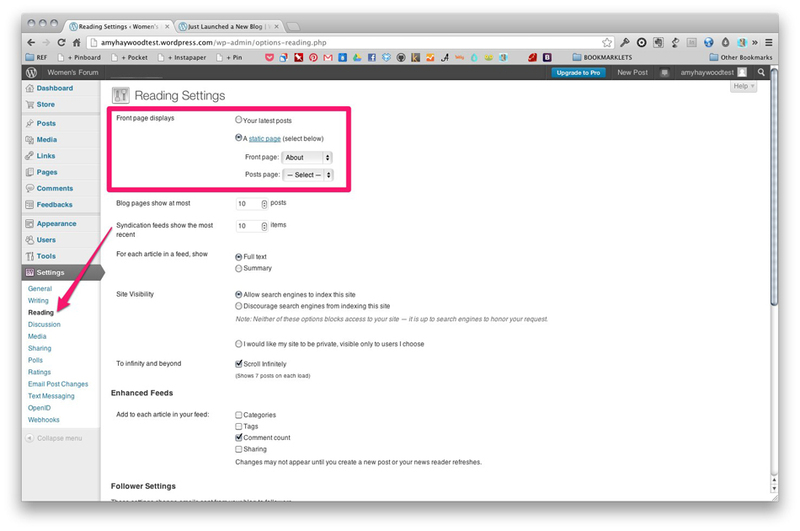 Or, you can create a new link by clicking on the link at the top of the page or in the left sidebar. 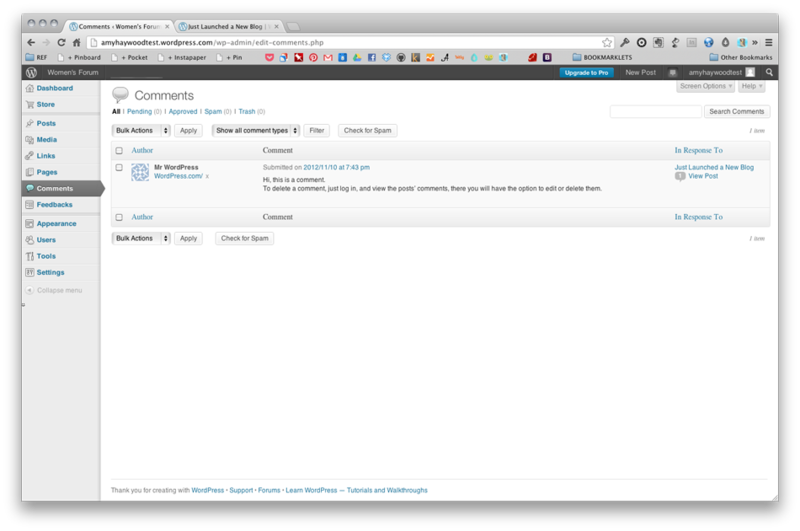 The comments section lets you manage the comments made on your site. You can approve, unapprove, reply, or trash a comment. You must approve all comments before they go live. 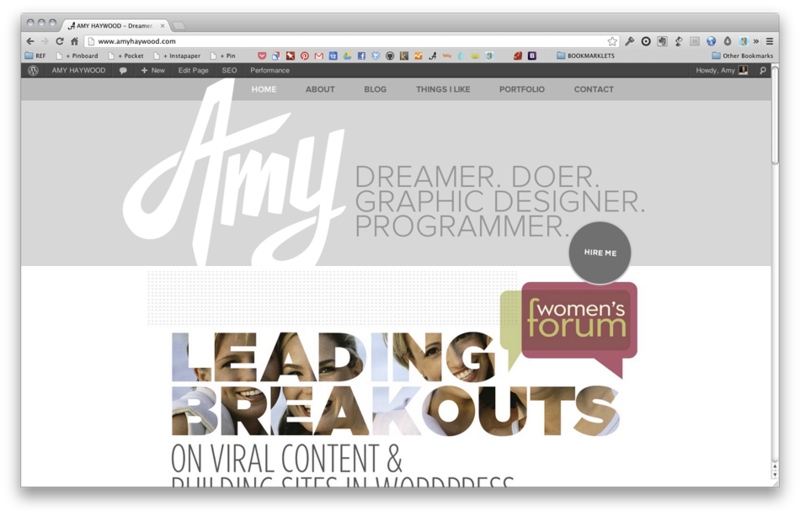 The cool part about WordPress is you can easily change your site’s appearance with the click of a button. You can change your site as often as you change outfits! But, just remember, you want to build a brand. When someone lands on your site, you want them to recognize it as your site. If you’re constantly changing the look and feel of your site, your reader might get confused. “Did I go to the right place?” So, once you land on a design, stick with it for a little while. Changing themes is as easy as finding a new one you like and clicking on the activate link. Widgets typically appear in a sidebar or a footer. — You know, when you go to a site and you see Archives, Favorite Links, Most Recent Posts, etc. These are all widgets. 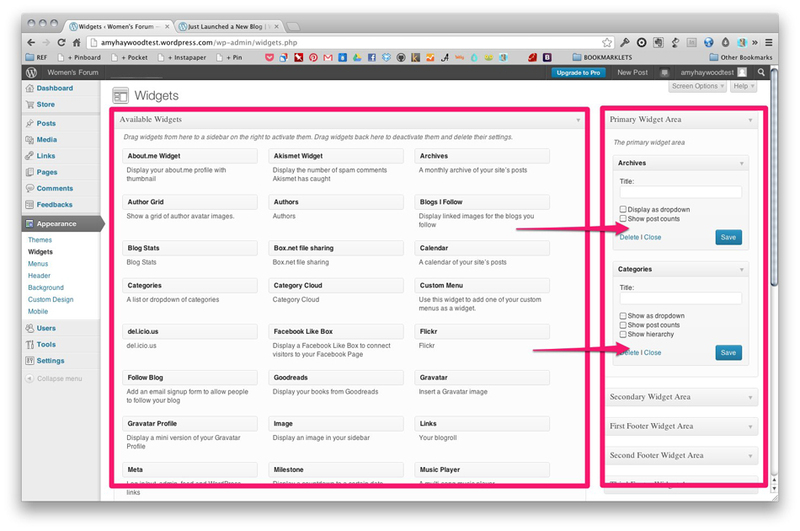 Managing widgets in WordPress is as easy as dragging and dropping what you like (on the left) to where you want it to go (on the right). You can easily change the order by dragging and dropping too. If you want someone else to help you manage your blog, Users is great for you! 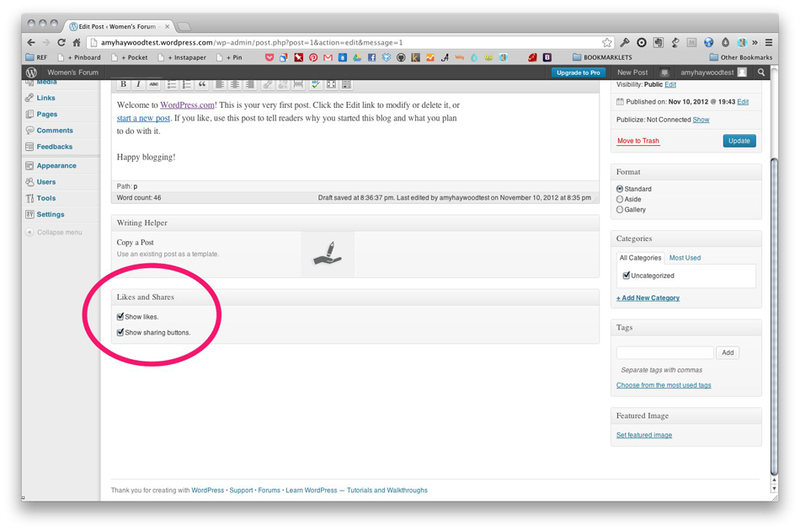 Just like a lot of the other sections in WordPress, you can edit an existing user by clicking on their name. 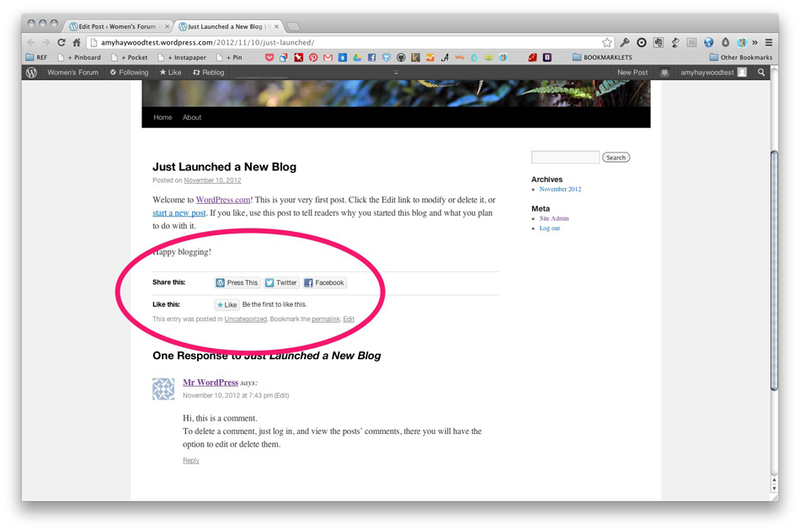 Or, you can easily add a new user by clicking on the Invite New button at the top or in the left sidebar to invite a new author / user to your blog. 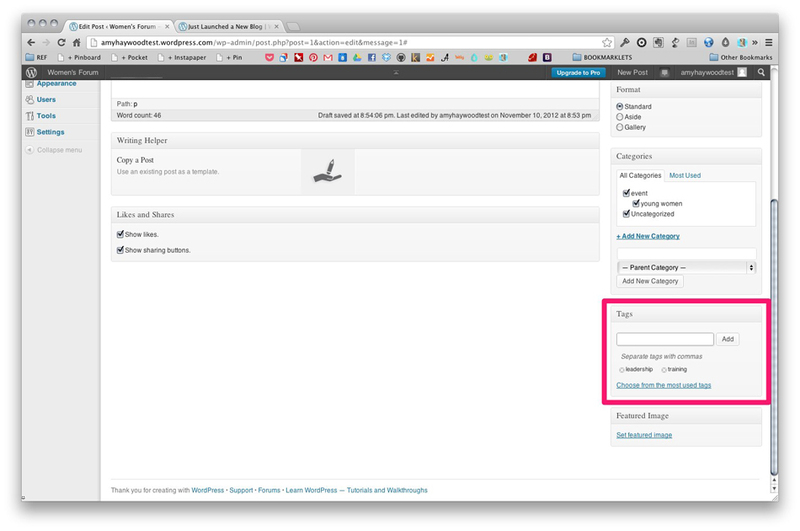 Then, select the page you want to use instead as your home page next to the Front page drop down. Congratulations! You made it to the end! So how about this novel?! Thanks for sticking with me! As I said in the beginning, this is just a brief (believe it or not) overview of everything that WordPress is capable of.